Those of us who were astonished at the proposal, which was mooted yesterday that MPs should receive an unconditoinal lump sum allowance instead of claiming expenses with receipts, were less surprised that the idea originated with Newport West MP and Shadow Secretary of State for Wales, Paul Flynn. Mr. Flynn is a man of the highest integrity, with the ability to think outside of the box. His problem, in my view is that his judgement is suspect as to which box he chooses to do his thinking out of. He wrote: "Our reputation has sunk from rock bottom to subterranean. Financial scandals have continued in both Houses with toe-curling regularity. "The public are still convinced that MPs use the system for own ends." Mr Flynn suggested a new system could be based on an allowance calculated on average expenses, based on MPs' distance from Westminster, and could be paid automatically. How exactly exemptng MPs from the full and proper scrutiny that any expenses system needs to work effectively will restore public confidence is difficult to understand. They may find the process of reclaiming expenses to be bureaucratic, tedious and mind-numbingly boring but so does everybody else. What makes them so special? Paul Flynn may accuse me of not understanding the issues, but I have been in the position of being a full time elected official with a busy office, a heavy caseload and many demands on my time. Despite that I made the time to complete expense claims in good order and ensured that they were accompanied by receipts and/or invoices as required by the rules. I also properly managed my staff, signing off their expense claims and conducting six monthly performance reviews. If MPs are struggling to fit all of this in then perhaps their real need is for time management courses, not special treatment and exemptions from the normal rules of accountabilty and transparency by virtue of a hefty back-door pay rise. Many many people work in occupations where they too have to claim expenses and work within a necessary bureaucracy to do so. Suggesting that poor pampered MPs are above all of this is no way to win back the public's confidence in the democratic system. One of the biggest impacts of us leaving the European Union is going to be on Higher Education. Universities and other institutoins have long taken advantage of the funding opportunities offered by the EU, both revenue and capital and now face the challenge of replacing that funding. Some, however say that there are inherent dangers in that process, especially in the way we fund research. The Independent reports that scientists have raised concerns about the increasing privatisation of academic research once the UK leaves the European Union, after it emerged two multinational pesticide manufacturers have given millions of pounds to universities. Referring to figures obtained under the Freedom of Information Act by Greenpeace, they say that the firms, Bayer and Syngenta, which both sell neonicotinoid insecticides linked to harmful effects on bees, gave a combined total of £16.1m to 70 British universities to fund a range of research projects between 2011 and 2016. Roughly, £2.6m of this money was spent on plant sciences, including research into pesticides. Neonicotinoids were once thought to have little or no negative effects on the environment because they are used in low doses and as a seed coating, rather than being sprayed. But evidence has been mounting that the chemicals do harm bees – important pollinators of food crops – with one recent study linking their use to “large-scale population extinctions”. As a result, neonicotinoids have been banned by the EU although they can still be used under licence. However both firms deny there is evidence to show the pesticides cause a significant problem for bees. Greenpeace's concern is that if research is to command public confidence, then it needs to be independent and impartial. That is why they say that public funding is so crucial. They make the point that we would not want lung cancer studies to be heavily reliant on funds from tobacco firms anymore than we would want research on pesticides to be dependent on the companies making them. It is crucial therefore that the Government ensures that scientists have access to the same level of funding after Brexit as before it. Personally, I have little sympathy with the plight of the Labour Party as outlined in this Guardian article. The paper argues that two hundred Labour seats, more than 85% of the party’s total, could be affected by the review of parliamentary boundaries due next month. They say that up to 30 Labour seats could disappear altogether, while the rest will see their composition altered in some form. The changes could give the Tories a substantial advantage at the next General Election. These changes were initiated by David Cameron with the objective of cutting the number of MPs by 50 to 600. The Tories say that the aim is to ensure that each person’s vote is of similar value by equalising the number of registered voters in each constituency to within 5% of 74,769. Naturally, a higher proportion of Tory seats are currently within this range, so only between 10 and 15 of the party’s seats are expected to disappear. As the paper points out, a similar exercise was begun in 2013 but abandoned by Cameron in the face of pressure from his Lib Dem coalition partners, and anger from his own backbenches. They add that the Tories are hoping to avoid a repeat of this anger by offering affected MPs the chance to move into seats vacated by retiring colleagues. It is difficult to argue against equality of representation and it is unfortunate that population changes have seen people move out of traditional inner city areas to the more affluent suburbs, thus leaving many Labour MPs high and dry. But the real scandal here is not that a long-overdue change is going to disadvantage the main opposition, but that we continue to be wedded to a system that disenfranchises millions of voters from being represented by their chosen party, gave the Conservatives 51% of the seats on 37% of the vote in 2015 and centres the outcome of General Elections on a handful of key marginals. With PR, every vote will count, people living in safe Tory or Labour areas, who have different allegiances, will be able to have some representation through a multi-member system that delivers according to the votes cast, and the government of the country will better reflect the way we voted rather than handing a majority to an unrepresentative minority. We will no longer see all the campaigning concentrated on the 50 or so seats which will decide the outcome. Instead there will be a full-blown campaign in every constituency that will offer voters a real choice. The fact that Labour have failed to grasp this and, even now are not advocating this solution is why I have no sympathy for their plight. The fact is that during the coalition years every constitutional reform proposed by Nick Clegg apart from fixed term Parliaments, was foiled by reactionaries in the Tory and Labour Parliamentary Parties, and that includes the very inadequate form of proportional voting that was put to a referendum vote. In this case, Labour are reaping what they sewed. It is one thing to be caught out on a PR stunt, but quite another to then lose all sense of perspective and try to turn a personal act of revenge against your nemesis into a higher cause. Alas, those leading the Labour Party have done exactly that, leaving their dummy on the field as they gun for Richard Branson. The Independent has all the details. They relate how Labour's Shadow Chancellor John McDonnell has called for Virgin's founder and CEO Sir Richard Branson to be stripped of his knighthood. Mr Branson's crime is apparently that he sought to "undermine our democracy" by authorising Virgin trains to release footage disputing Jeremy Corbyn's claims about overcrowding on one of its services. If disagreeing with, or humiliating 'Saint Jeremy' now constitutes 'undermining our democracy' then we really have entered an alternative Orwellian universe. God help us if these people ever get into power. The UK would become one big prison camp in which all dissent is outlawed and private property confiscated. That may be an unfair exaggeration but it is the logical conclusion of McDonnell's current stance. I have written already on the racist legacy of the Brexit campaign, now the United Nations has chipped in with a statement by the UN’s Committee on the Elimination of Racial Discrimination that it is “seriously concerned” that British politicians whipped up hatred and then “failed to condemn” racist abuse during the campaign. The Independent points out that immediately following the referendum hate crimes surged by 42 per cent in England and Wales, with a total of 3,076 incidents recorded across the country between 16 and 30 June. They add that police figures show that many areas that voted strongly for Leave posted even higher results. The UN Committee's report’s says that they are concerned about the “negative portrayal” of ethnic minority communities, immigrants, asylum-seekers and refugees in the British media. Ukip leader Nigel Farage was widely criticised for unveiling a poster with pictures of Syrian refugees alongside the caption the “breaking point”. He was also criticised for saying the referendum campaign had been won “without a shot being fired”, despite the shooting of Labour MP Jo Cox. No doubt the brexiteers' reaction to this report will be to call for a referendum on us leaving the UN. The wider implications of the normalsiation of racist language in UK politics though have still not been fully assessed. All of this has consequences. It is up to the media and politicians on all sides of the political divide to try and heal the sores they have opened up by once again making it unacceptable to act in this way. Could Labour's flagship conference be cancelled this year? There are some who might suggest that a party that cannot even organise its own annual conference are not capable of running the country. Fortunately, there is a professional civil service who are able to ensure that the wheels of government are able to keep running irrespective of who is in power. Alas, that does not appear to be the case with the Labour Party, who seem determined to self-destruct at every level. The Independent reports that the prospect of the Labour Party cancelling its annual conference has become ever more realistic after G4S turned down a last-minute offer to provide security. G4S has apparently been present at the event for 20 years, but has recently been criticised by party figures, including Jeremy Corbyn, for various prison contracts and links to Israel. As a result Labour found a replacement security company called Showsec, but they are in the middle of an industrial dispute with the party over union membership for its workers. There have been threats to form a picket line outside the conference entrance, which several Labour members have said they would refuse to cross. Merseyside police re not willing to allow the event to go ahead without security, and that they are not in a position to provide it. The prospect of Labour not having a conference at which it can announce the results of its leadership election looms ever larger. Is the gaffe-prone Owen Smith leaving Labour members with a hobson's choice for leader? Considering Labour MPs chose Owen Smith as the best chance they have of unseating Jeremy Corbyn the Pontypridd MP's perfomance so far has been less than inspiring. Smith's anointment as the favoured 'pretender to the crown' makes one wonder whether the Parliamentary Labour Party were either punishing him for some hidden misdemeanor or just having a laugh at the electorate's expense. More likely is the possibility that many in the Parliamentary Labour Party had made the judgement that whoever they chose as challenger would not be able to beat Corbyn. Their reasoning may have been that it was better to pitch an untried newcomer with a high, but misplaced regard for his own competence against the Labour leader, rather than spoil the chances of a genuine leadership contender such as Angela Eagle in the future. Whatever the motive, those MPs who had placed their trust in Smith to put up a good show must be disappointed at his performance so far. Instead of pitching his challenge as that of a moderate centre left politician with a real chance of winning over Middle England, Smith has chosen instead to paint himself as a slightly more competent mirror image of Corbyn. In doing so he has denied Labour members a real choiice. Even then he has been weighed down by his own past baggage, his previous pronouncements for the use of the private sector in the health service for example. This has seen him having to square some very difficult circles so as not to undermine his current positions, when it might have been better to have embraced them as a sign that he is the sort of pragmatic and realistic politician who could actually run the country. These reinventions of his past have in turn led many Labour members and ordinary voters to conclude that Smith is just another politician in the Blairite mould, a stark contrast to the refreshing candour and consistency of Jeremy Corbyn. They have also prevented him from effectively capitalising on Jeremy Corbyn's own gaffes such as the recent traingate (do trains have gates?). As the Labour Campaign for Mental Health has noted, “lunatic” is an unhelpful, derogatory term that infers some level of mental illness. Such a stigmatising and unnecessary taunt could have been avoided if “unity” candidate Owen Smith had bit his tongue. If you think that is a bit too politically correct then it is worth noting, as the Independent has done, that it was only a few days ago that Owen Smith criticised Jeremy Corbyn for “abolishing” the Shadow Minister for Mental Health role, despite the fact that it was the refusal from many in the Parliamentary Labour Party to serve under the elected leader that resulted in the vacancy. In the same breath he spoke of how mental health would be a priority under his leadership, and that he would be a “champion for disabled people”. This is not the first clanger Smith has dropped or his first apology. He accused Jeremy Corbyn of being partially responsible for misogyny in the Labour Party and attacked him for not cracking down on it, but then talked about the need to “smash Theresa May back on her heels”. These remarks echoed his sentiments when he told Plaid Cymru leader Leanne Wood that she was invited onto Question Time because of her “gender”. He also undermined the main criticism of Corbyn’s foreign policy and the Labour leader's attitude towards national security when he put forward the absurd proposal that we should be getting “round the table” with Isis. If Owen Smith is the answer to Labour's problems then they need to rephrase the question. Was Farage the victim of internal dirty tricks in South Thanet? Just how toxic is the on-going civil war within UKIP? Well, if the Guardian is to be believed it extends to senior members actively sabotaging the election campaigns of their colleagues. The paper says senior members of UKIP have accused the party’s only MP of helping the Conservatives defeat Nigel Farage in South Thanet in last year's general election. UKIP’s main donor, Arron Banks, has written to Kent police with the allegation that Douglas Carswell, the Ukip MP for Clacton, helped the Tory campaign retain the seat. his letter details allegations that Carswell downloaded Ukip data for South Thanet and passed it to the Conservatives, enabling them to do “push polling” of key voters. Push polling is when an apparently unbiased telephone survey spreads negative rumours about a candidate. According to the letter, Carswell was granted access to the Ukip database but then only accessed the South Thanet data. A letter sent to the police by Precision Risk & Intelligence, where Banks is chief executive, claims that “we have evidence of excessive spending by the Conservatives and secretive dealings between them and a senior Ukip representative to collude against Mr Farage”. It may be that any unauthorised use of the Ukip database would be a breach of data protection laws. The letter also claims that the information was passed to a call centre in New Malden, Surrey, and was then used to target voters in South Thanet. The call centre in Surrey has close links to the Conservative party. Kent police are investigating allegations of improper election spending by the Tories in South Thanet, a highly marginal seat at last year’s election. They were recently granted a further 12 months to investigate electoral spending in the constituency after a judge concluded that the inquiry could lead to the result “being declared void”. It is not just Wales where respective members of UKIP cannot stand the sight on one another. Clearly riled by equally irrelevant tweets showing how countries within the European Community had topped the Olympics medal table, the MP for South Derbyshire hit back, and in doing so sought to resurrect the British Empire. At least the EU is a current institution. Another tweeter asked her to do a similar chart so as to feature the Roman Empire and the Spanish Empire. I suspect both of those would have trailed behind the EU. If I were to be pedantic about this, I would also point out that Brexit has not happened yet and that the EU currently includes the UK. Thus the medal total for that particular institution should be 325, not 258. This not just a failure to be self-aware on the part of the Tory MP, but also a misunderstanding of history and an affront to Britain's many friends throughout the world. Alas, it is all too typical in a world where the unthinking right wing are in the ascendant. It was less than a month ago that some Labour MPs were briefing that if Jeremy Corbyn wins the leadership contest in September that they would elect their own leader and launch a legal challenge for the party's name. Alas cold reality, not least through speaking to their own constituency members appears to have modified that stance. According to the Independent the plan now is one of non-cooperation and a work-to-rule. The paper says that Labour MPs might try and use the Co-Operative Party, a political group affiliated with Labour, as a means to oppose Mr Corbyn. One Labour MP is quoted as saying: “People are not going to suddenly change their view of Jeremy just because September the 24th occurs. People still have that view, and all the problems still exist. “Things are going to come up where the divisions are insurmountable. People are not going to suddenly just take a lead from Emily Thornberry on Brexit. “It’s really not clear cut what’s going to happen. There are still tensions between different groups. “A lot will depend on how Jeremy would act after a victory. There is talk of him trying to push out [Labour chief whip] Rosie Winterton. So business as usual then? The so-called Labour rebellion will fizzle out and, apart from a few grumbles here and there, the Parliamentary Labour Party will sullenly go about their business, trying to ignore Jeremy Corbyn as he consolidates his position and that of his successor. Of course, once the reselections start all bets will be off. Meanwhile, the Western Mail speculates that the general secretary of Welsh Labour and the head of its press office are on a “hit list” of party staff members whose jobs will be at risk if Jeremy Corbyn is re-elected. They quote party sources as claiming that David Hagendyk and Huw Price could be “purged” as part of an initiative aimed at bringing the party more under the control of Mr Corbyn’s left wing supporters. Has the civil war within Labour only just begun? Is Britain's post-Brexit future threatened by the ignorance of Brexiteer ministers? Today's Observer contains a serious feature which suggests that the UK is making little progress towards leaving the EU because of the complexities of leaving the single market, the failure of either the Leave or Remain sides in the referendum to prepare for the eventual outcome and divisions within the cabinet as to what sort of final settlement we should aim for. In particular, they say that senior UK diplomats have been shocked by how little leading Tories in government, including Boris Johnson, understand about the workings of the EU and its single market. That will explain a lot of the lies and isinformation which won them the referendum in the first place. Before the referendum, May strongly suggested the UK should remain a member in the event of Brexit. Now, whether and how it can do so is the multibillion-euro question at the heart of the Brexit dilemma. The single market serves 500 million EU citizens, allowing the free movement of goods, people, services and capital between member countries. If the UK quits the single market, it will lose full access and many large UK businesses warn of devastating economic results. But if it remains a member, after quitting the EU as a whole, it must play by its rules, continue to pay into the EU budget and accept the right of EU citizens to live and work in the UK. For hardline Brexiters – who promised that Brexit would save £350m a week in EU budget contributions that could then go to the NHS, and the restoration of UK control over its own borders – that would be unacceptable. It would render Brexit meaningless, they say. Thus far, however, the May government has been unable to give clear and consistent answers on the single-market question, because the Tory party and the cabinet is split and the complexities are only now being grasped. "I think that two months down the line the senior Brexiters are beginning to realise that the whole process is going to be a lot more complicated, time-consuming and boring than they had imagined before, when they had presented it all as black and white. They are beginning to realise that this will occupy most of the energies of government for the next five to 10 years." This is all complicated of course by the referendum, which confirmed what the British public are against but left us with no idea what they wanted government to replace it with. Not only has the UK voted to leave the EU based on a campaign of lies and misinformation but it transpires those misleading us didn't have a clue about the realities either and are not up to the job of delivering what they promised. I have no intention of commenting or passing judgement on allegations that have surfaced against UKIP's 'Welsh leader', Nathan Gill, that he misused European money. Gill robustly denies these allegations and they are now in the hands of the EU counter-fraud body Olaf, who are looking into them. What is more interesting though is where these allegations came from. The Western Mail say that they originated from former employees of Gill, an indication of how toxic things have become within UKIP's Welsh branch. The party's Assembly leader, Neil Hamilton has issued a statement in which he asks whether this 'shocking news' was the reason Gill resigned from the UKIP Assembly group. I think it is a fair bet that he knows this was not the reason. Hamilton also says that the easiest way to put this matter to rest is for Gill to 'publish all details of his MEP's emoulments and expenses claims since May 2014, together with full supporting documentation'. Hamilton goes on to imply some form of conspiracy by adding that 'for some reason' Gill refuses to publish this information. I am currently reading a book about Bill Clinton's presidency and this is precisely the sort of innuendo that was used to go after the Clintons over the Whitewater controversy. A scandal in which both were cleared of any wrongdoing several times over. Although Neil Hamilton is right to draw attention to the excellent practise of the Welsh Assembly of publishing details of all Assembly Members expense claims within three months of them being settled, even that exemplary scheme does not make available the sort of documentation Hamilton wants Gill to put into the public domain. As it happens I agree that MEP's expenses should be published in the same way as those of Welsh Assembly Members and Gill and the other Welsh MEPs should set an example by doing so voluntarily. However, to pretend that such a publication will make this investigation go away as Hamilton does, is misleading and he knows it. Allegations have been made and the investigation will have to follow its own course irrespective of the public bitching between two of Welsh UKIP's most prominent members. Meanwhile, Guido Fawkes has published an interesting e-mail from Neil Hamilton, sent to members of UKIP's NEC on Sunday, days before details of the allegations against GIll became publicly known. Hamilton is no stranger to allegations of impropiety himself, but he has never been accused of possessing a crystal ball before. Is it any wonder that UKIP are ripping themselves apart? Is the traditional motor car heading for the scrap heap? Interesting news in the Independent that the Dutch government has set a date for parliament to host a roundtable discussion that could see the sale of petrol- and diesel-fuelled cars banned by 2025. Richard Smokers, principle adviser in sustainable transport at the Dutch renewable technology company TNO, said the Dutch government was committed to meeting the Paris climate change agreement to reduce greenhouse emissions to 80 per cent less than the 1990 level. The plan requires the majority of passenger cars to be run on CO2-free energy by 2050. "Dutch cities still have some problems to meet existing EU air quality standards and have formulated ambitions to improve air quality beyond these standards," he told The Independent, adding that the government had at the same time been reluctant to implement strict policies on the environment. There is no doubt in my mind that this is the way forward, however we still have some way to go before we can achieve a fume-free transport network. There still needs to be improvements in the storage capacity of batteries, though there have been major strides in recent years. And there also needs to be a massive investment in charging points by the UK Government if we are to follow suit. We also need to improve our use of renewables and accelerate the electrification of our railway network. Not for the first time the UK is way behind continental Europe in this area. We need to ensure that Brexit does not push us further behind. We cannot afford to be Europe's most polluting country. As the Western Mail reports, the stand-off in the UKIP Assembly group appears to have come to a head with the decision of Nathan Gill to leave and sit as an independent AM. Despite this, Gill insists that he remains leader of UKIP in Wales and that he will continue to sit as a UKIP MEP in the European Parliament. Even by UKIP standards this piece of political contortionism defies credibility. Neil Hamilton, who leads the UKIP Assembly group argues that Gill has forfeited the role of Welsh leader. He has just been on Radio Wales denying that he bullied the North Wales AM. The fallout from Gill's decision has already become bitchy. Hamilton told BBC Wales he did not think Mr Gill's decision would make "much difference", claiming: "We don't see him much in the assembly." In the meantime UKIP leadership candidates at lats night's Newport hustings were lining up to distance themselves from Gill. Nobody has really explained how this decision by Gill impacts on the current ballot of members to decide if he should be forced to give up one of his two full-time roles. UKIP may be searching for a new leader and a new role within UK politics, its former leader may or may not be emigrating to Germany, but here in Wales they are intent on accelerating their decline through their dysfunctional behaviour and public bickering. There are many who voted for the UK to leave the European Union in June as protest against the two opposing groups of politicians who they saw as lying to achieve their chosen outcome. Alas, despite being accused of promoting 'Project Fear', it is the remain campaign whose claims are being proven to most accurate. The latest sign that Brexit will be bad for the health of our economy is the news that big investment banks with their European headquarters in London will start the process of moving jobs from the UK within weeks of the government triggering Brexit. That is a faster timeline than their public messages of patience imply. The Independent reports that dismayed by the lack of a clear plan to protect the UK’s status as a global financial hub, executives are planning for the worst. They believe that they will lose the right to sell services freely around the European Union from the City. While UK Prime Minister Theresa May has said she will fight for the City of London to retain its passporting rights, bankers and lawyers say she faces an uphill battle trying to win concessions from EU partners still smarting from the outcome of the 23 June vote. Bank executives are privately discouraged that seven weeks after the referendum, the ministers in charge of negotiating the best deal for the UK believe they can retain the benefits of being in the single market without accepting the free movement of EU citizens, the people said. Banks are in a race against each other to secure the best office space and accommodation for the thousands of workers they would eventually move from the UK, given the limited number of suitable destinations in those cities. They also want to be first in line with the local regulators, who will likely struggle to cope with an influx of investment banks asking permission to set up shop. Before the referendum, Jamie Dimon, JPMorgan chief executive said he would relocate as many as 4,000 employees to the continent after Brexit. Morgan Stanley may move as many as 1,000 employees out of the UK, while Goldman Sachs Group and Citigroup indicated they would also shift people abroad. European banks including HSBC and Deutsche Bank said they may have to move people or activities to France and Germany. We reap what we sow and none of it is good news for the UK economy. It is my strong view that where there is public money involved in the appointment of any position then there should be a proper and transparent process involving advertisment and competition so as to ensure that the best person gets the job. To avoid doing so not only opens the door to cronyism and favouritism, but it also undermines equal opportunities and potentially discriminates against minorities because they do not have a chance to apply and be assessed on their own merits. This is certainly the case in North Wales where, as is reported in the Daily Post their police and crime panel last month declined to rubber-stamp the appointment of Ann Griffith as Commissioner Arfon Jones’ new deputy after claims there had been “a lack of transparency” and that the £42,000 a year job had not been advertised. The fact that the North Wales Police and Crime Commissioner was elected may give him the legal right to overturn the panel's decision, but it does not give him the moral right to appoint a political ally to a publicly funded post without a proper appointment process being followed. In my view that is a disappointing use of his office. The Welsh Government is equally as guilty of this 'cronyism'. In both the last Assembly and this one they have appointed a total of ten Special Advisors without any proper competitive process. These jobs attract a salary of between £55,000 and £70,000 a year. The Welsh Government claim that the way they appoint Special Advisors is not new. Their spokesperson also says that they use the same process that was followed by my party in the coalition Welsh Government between 2000 and 2003. Both claims are untrue. In that coalition government there was a competitive process involving advertising the posts and interviewing multiple applicants. That method has apparently been abandoned in the last five years. In 2004, the Welsh Government spent £12,392.03 in advertising Special Advisor posts. In 2005 that amount was £12,385.30 and in 2008, it was £1,066.83. In 2011 and 2016 they spent no money at all in advertising 10 posts. The facts contradict the Welsh Government's claims. Without a properly competitive process the Welsh Government cannot guarantee the best people are given the jobs. They are in breach of equal opportunity legislation. Publicly funded posts should not be appointed at ministers’ discretion. They should be advertised and appointed in the same way as any other public sector job. The Independent reports on the views of a church minister who grew up behind the Berlin Wall and who fears being seen as an intruder in Scotland following the Brexit vote. The Rev Aniko Schutz Bradwell, who leads the Humbie with Yester, Bolton and Saltoun congregations in East Lothian, said the rhetoric of politicians in the Brexit campaign seems to have "made it legitimate to use racist language". She says she is more nervous speaking German in public since the vote. The Reverend Bradwell is not alone in her anxiety nor is it ill-founded. Back in June the Independent reported that more than a hundred incidents of racial abuse and hate crime have been reported since the UK voted to leave the European Union. Many of the alleged perpetrators cited the decision to leave the EU explicitly. The Institute of Race Relations details some, but not all incidents on its website. They highlight a new report compiled by activists from three social media platforms and published by #PostRefRacism which analyses 645 racist and xenophobic incidents reported to them following the referendum vote. Abuse aimed at people with non-European BAME backgrounds made up the majority of reported incidents – nearly a third of the total – with ‘South Asians’ reporting the most incidents (16 per cent). Around a fifth of the abuse aimed at this group was also Islamophobic. The second most affected group, with 21 per cent of victims, was the combined Eastern Europeans and Western/Southern Europeans. The largest nationality most often specifically recorded within this group was Polish, making up 40 per cent of all ‘European’ victims. In 51 per cent of incidents, perpetrators referred specifically to the referendum in their abuse. These most commonly involved the phrases ‘Go Home’, ‘Leave’ ‘f**k off’, followed up by statements such as ‘we voted you out’, ‘we’re out of the EU now, we can get rid of “your lot”‘, ‘when are you going home’, ‘shouldn’t you be packing your bags’. The EU referendum result has perhaps emboldened racists by leading them to believe that the majority agree with their views on immigration and legitimising such public expressions of hatred. For this, the political elite must take responsibility, after stoking a divisive referendum campaign that demonised immigrants by spreading fictitious scare stories, all the while pandering to the lowest common denominator. Despite Boris Johnson once saying he was pro-immigration, his campaign focused its message on immigration, creating unrealistic and unachievable expectations of what migration figures could be. Not only did it falsely claim that Turkey was about to join the EU but it also claimed that Turks were in some way a threat to our national security, highlighting its proximity to Iraq and Syria on a poster. There are no two ways about it: such messages must either be the work of duplicitous demagogues or incompetent and irresponsible migration scaremongers. Let’s not forget Nigel Farage’s risible anti-migrant “breaking point” poster, which was even reported to the police for allegedly inciting racial hatred. As Sayeeda Warsi told the BBC, “This kind of nudge-nudge, wink-wink xenophobic racist campaign may be politically savvy or useful in the short term but it causes long-term damage to communities” – a prediction that is unfortunately being proved correct. This xenophobia was reinforced by national newspapers, who throughout the first six months of 2016 carried dozens of anti-immigration stories. Leaving the European Union is going to be traumatic but we will find a way through. The damage to our society of the legitimisation of racism will take much longer to heal. As it were not bad enough that the majority of those leading the campaign to leave the EU had washed their hands of the whole affair, walked away and left others to pick up the pieces, those who are left are squabbling amongst themselves. The Telegraph reports that there is a turf war raging between two of the departments of state tasked with negotiating the terms of the United Kingdom's exit from the EU and, more importantly putting in place alternative trade arrangements to stop our economy going down the pan. Dr Fox, suggested that British trade with other countries would not "flourish" if responsibility for future policy remained with the Foreign Office. He also listed a series of economic statistics which called into question the Foreign Office's ability to boost Britain's economic ties with other countries and suggested that Mr Johnson focused instead on "diplomacy and security" including overseeing MI6 and GCHQ. The Foreign Secretary is understood to have firmly rejected Dr Fox's demands and Whitehall sources claim that the Prime Minister is "unimpressed with this sort of carrying on". The letter represents the first evidence of significant tensions between Mrs May’s Eurosceptic Cabinet ministers. There is nothing more undignified than victors scrapping over the spoils and there is nothing dignified at all about this disagreement. If the Brexiteers cannot even present a united front in fighting for Britain's interests then what chance is there of them negotiating trade deals that will compensate for the losses involved in us leaving the EU? The failure of those campaigning for us to leave the EU to take any responsibility for the impossible paradise they promised voters has already been well-documented. Having won the referendum, the vast majority of them disappeared back to their hall of smoke and mirrors and left others to pick up the pieces. Now, with the announcement by the Chancellor of the Exchequer today that he will guarantee continued funding for EU projects in the wake of the Brexit vote we are seeing how impossible it actually is to deliver on those promises. The guarantee leaves precious little money to meet the commitment of an extra £350m a week for the NHS, whilst barely covering what we were expecting from the EU in the first place. As the Welsh First Minister points out in the Western Mail today, the deal only covers about half the regional aid due to Wales. The guarantee does not cover transformational projects such as the South East Wales Metro. Carwyn Jones is quite right to say that we need a ‘full guarantee’ from the UK Government that funding will continue for the existing EU programmes to 2023. He is also right to say that there should be further funding to address Wales’ economic and social needs, particularly in our most deprived areas after this date. The case for a major and immediate revision of the Barnett Formula, to take into account Wales’ needs arising from EU withdrawal is now overwhelming. The nirvana promised by those campaigning to take us out of the EU can only be delivered if the UK Government changes its funding arrangements accordingly. So far there is little sign that they are willing to do so. A new report by Shelter Cymru has found huge inconsistencies in the amounts private sector tenants are charged by letting agents, a lack of transparency in what they are being charged for and widespread flouting of a new law designed to improve the letting process. The report is based on a mystery shopping exercise of 85 letting agents across Wales. It found that despite the Consumer Rights Act 2015 requiring agents to display a full list of fees in the office and on a website, if applicable, more than half did not do so in a clear and understandable way. Of the agents that did display fees online, more than half gave out a different fee structure over the phone. In addition the survey found a wide variation in the fees charged to tenants, ranging from £39.99 to £480. The vast majority of tenants would be required to pay between £100 and £300 just to take up a tenancy. A deposit and rent would be charged on top of this. This report has highlighted a failure of fairness and transparency in the way that tenants are treated by letting agents. Many letting agents do not follow the legal requirement to display their fees clearly and often contradict published schedules when spoken to over the phone. With a growing number of people moving into privately rented accommodation, this is a major problem and is driving up the cost of renting for many poorer individuals and families. What is more, whereas a landlord can shop around for a suitable letting agent, a tenant does not have that choice. He or she is focussed on the property and has to deal with the letting agent assigned to it. That is a major breakdown in the market. Attempts at regulation and improved transparency are not working. The system is being abused and is inadequately policed. It is time for decisive action by the Welsh Government to follow the Scottish example, outlaw these charges altogether and work with letting agents and landlords to design a more satisfactory system that does not penalise tenants. Is it back to the 1980s with Labour? Those of us who cut our political teeth in the 1980s will remember the battles for the heart and soul of the Labour Party as 'moderates' sought to repel a determined effort by the Militant Tendency to take over their party. This was particularly intense in Swansea West, where I lived in the early years of that decade where there was a concerted attempt to deselect the then-sitting MP, Alan Williams. The fact that Labour's Deputy Leader, Tom Watson has referenced those struggles in the dossier he has sent to Jeremy Corbyn says a lot about the present struggle for control of the Labour Party. Already this year we have seen a number of Labour Councillors deselected in Swansea, with more in the pipeline. The Guardian says that Watson has sent the leader’s office a four-page document, based on publicly available information, detailing what he said was evidence that Trotskyists had been attending meetings of grassroots pro-Corbyn Momentum pressure group and seeking to influence the Labour; leadership election. He claimed some of the individuals involved were members of other parties, including the Socialist party, the successor to Militant, whose members were expelled from the Labour party by Neil Kinnock. The evidence included reports from the Socialist party’s website of its members addressing Momentum rallies and tweets from an activist expelled from Labour earlier this year who appeared to be running phone banks backing Corbyn in the leadership race. The stakes are higher than ever for Labour in this leadership contest. The votes have been counted, the result has been announced and the UK is leaving the European Community. But what will we put in its place? That is question that voters were not asked to give their verdict on and as a result it has been left to politicians to 'interpret the will of the people'. In doing that they must act in the best interests of the UK, yet according to the independent Institute of Fiscal Studies, our interests are best served by staying within the European Single Market. The Institute for Fiscal Studies said that Britain could enjoy the same sort of access to the world’s biggest market on the same World Trade Organisation terms as other non-EU member states such as the US, China or India. But it said membership of the single market provided additional benefits that might be lost depending on the deal struck by ministers in Theresa May’s government. Ian Mitchell, research associate at the IFS and an author of the report, said: “From an economic point of view we still face some very big choices indeed in terms of our future relationship with the EU. There is all the difference in the world between ‘access to’ and ‘membership of’ the single market. The IFS said single market membership meant elimination of trade barriers not possible under existing trade deals. These included so-called “non-tariff” barriers such as licensing or regulations that make it harder to export goods and services. The thinktank added that service sector exports were becoming especially important to the UK, accounting for 44% of total exports in 2015, up from 31% in 1999. Two-fifths of service sector exports go to the UK, whereas the Bric countries (Brazil, Russia, India and China) account for less than 5% together. The choices facing us therefore are difficult ones, but the conclusion is clear and stark: outside of the single market, whichever way you finesse it, we are worse off, everything else is second-best and will cost jobs. Is money the reason UKIP gave Nathan Gill a second chance? Walesonline suggest that one of the reasons the UKIP National Executive backed off expelling their sole Welsh MEP from the party was money. Nathan Gill had faced expulsion in a row over “double jobbing”, having been accused of breaking a promise to resign as an MEP after being elected as a regional AM for North Wales in May’s National Assembly election. Mr Coburn told the NEC that if the party failed to nominate a replacement for Mr Gill, there would have to be a by-election at an estimated cost of £5m. If Ukip failed to win the by-election, all four MEPs from Wales would be pro-EU. In addition, Ukip would have to repay around £60,000 that has already been spent from cash allocated to it by the European Parliament. Just when we thought that the Labour Party could not get any more chaotic the inevitabe happened and their leadership contest was thrown into disarray by a court ruling that reinstated the voting rights of 130,000 members. As the Guardian reports, a high court judgment, issued on Monday morning, struck down the six-month cut-off point imposed by the NEC for members to vote in the leadership contest, with Mr Justice Hickinbottom saying it was a breach of contract against the five new members who brought the case. If they lose then Labour may have to refund the £25 paid by many of these members to secure a vote in the leadership contest. That could cost them millions of pounds. For Labour MPs this ruling is a disaster. It effectively ends Owen Smith's challenge to Jeremy Corbyn and entrenches the Islington MP as the man who will lead Labour into the next General Election. As if this were not bad enough for the Parliamentary Labour Party, Corbyn's supporters have swept the board in elections to the party’s ruling National Executive Committee. The result of the NEC elections show that the six members elected to represent constituency Labour parties were Corbyn backers, while his critics, including current member Johanna Baxter, who recently complained about bullying in the party, and the comedian Eddie Izzard lost out. These new NEC members will take up their seats after September’s annual party conference. The Guardian reports that Labour MPs critical of Corbyn believe that the combination of the high court judgment and the triumph of the pro-Corbyn slate means that he has significantly tightened his grip on the leadership. “This is very, very, very bad news,” said one. Is a formal split in the Parliamentary Labour Party imminent after all? Will UKIP's Welsh branch perform an act of self-immolation? Despite their electoral success in recent years, UKIP in Wales remains a fairly small party in representative terms. Having been a member of a group of six and then five on the Welsh Assembly myself, I know how difficult it is to cover all the committees, to properly scrutinise legislation and to hold Ministers to account when you are trying to do a number of jobs at the same time. If therefore UKIP proceed with their plan later today to expel their only MEP, who is also one of their seven AMs, for what are effectively process issues, then there must be real questions as to their commitment as a group to do the job they were elected for. Yes, Nathan Gill has two full time jobs and yes, that arrangement is unworkable over any length of time, but he has already said that his main priority is the Welsh Assembly and I would expect to see him there for the vast majority of the sessions allocated to him. That is not to say that the Neil Hamilton faction do not have a point. Nathan Gill appears to have broken a clear promise to his party and to the electorate, whilst his determination to continue with both roles looks like jumping on the gravy-train. In Nathan Gill's defence, isn't this the sort of behaviour we have come to expect from UKIP anyway? After all there is a long catalogue of some of their MEPs maximising their income from Europe, though I accept that this is not the motive in Gill's case. As this affair comes to a head at a UKIP National Executive Committee meeting later today it is worth reflecting on the chaos that the party has visited upon itself since entering the Welsh Assembly. It is clear to me that this is a proxy row designed to remove opposition to the UKIP Assembly leader, Neil Hamilton. For all their talk of shaking up Welsh politics, UKIP have been divided and ineffective from the start. As the real work begins in earnest next month in scrutinising ministers, debating legislation and conducting inquiries, there are real doubts as to whether a number of their AMs are up to the job they have been elected to do. Just three months after the Assembly election, the Welsh branch of UKIP are looking like a busted flush already. That the proposal to nationalise the Red Lion pub in Westminster for the sole use of MPs during the refurbishment of the Palace of Westminster was even considered shows some seriously misplaced priorities for the UK's legislators. The Guardian reports that Richmond House, which hosts the Department of Health is the likely new home for the House of Commons when a multi-billion pound refurbishment of their current home gets underway. Richmond House is one of three government buildings owned by Middle East financiers who have bought into an Islamic bond issued by the government. One of its stipulations is that no alcohol will be sold on the premises. To get around the restriction, some MPs have proposed taking the Red Lion pub, located between parliament and Richmond house, into public ownership and banning entry to the general public. However, the move was opposed by Fuller’s Inns, the Red Lion’s owners, and a parliamentary subcommittee eventually ruled out the proposal. MPs are unusual as their workplace boasts 10 licensed bars and restaurants. Very few other workplaces boast such a provision and it is arguable that the culture generated by the easy availability of alcohol undermines effective working and contributes to the macho atmosphere there. It would be nice if MPs could show some restraint for once and set an example for the rest of the UK. One of the more innovative policy decisions presented to voters at the Welsh Assembly elections was the rent-to-buy scheme proposed by the Welsh Liberal Democrats. This scheme recognised that many young people can afford to pay rent and/or a mortgage but are unable to get together the 15% or 20% of the purchase price needed for a deposit. The idea is that they rent a property and over a 25 year period their rent counts towards purchasing it. Thanks to Kirsty Williams' deal with Labour, this is now Welsh Government policy and I look forward to proposals coming forward to implement the scheme. This housing association sources the tenants, either through local authority housing waiting lists or via the local authority’s choice-based letting system. Decisions are made on a case-by-case basis, although Rentplus expects the scheme to be suitable for around 60% of the people on waiting lists. There is no deposit to pay and tenants will pay either 80% of the market rent or a sum equal to the local housing allowance – whichever is the lower of the two – to enable them to save every month while they are renting. During the pre-agreed rental period, tenants can leave the property with a month’s notice. But provided they pay their rent on time, display no anti-social behaviour and stick to the terms of their agreement, the housing association landlord cannot ask them to leave. Their rent will increase by 1% plus inflation (as measured by the consumer prices index) each year. Every five years, it is reset at no more than 80% of market rent. Unlike shared ownership schemes, tenants do not have to pay for service charges or repairs while they are renting the property. At the end of the agreed rental period, as long as the original tenant is still living in the property, Rentplus will transfer a 10% cash deposit to the tenant’s solicitor prior to the property purchase. Home ownership in my view is not a legitimate policy objective for government in its own right, but as part of a suite of measures designed to put in place affordable homes to meet all needs it has its place. The key is to ensure that the subsidies we apply are appropriate to the means of those who receive them. In that way we make the maximum use of public resources whilst ensuring that people are able to have the homes they need. Those of us who have been arguing for some time that the UK Government's badger cull is misguided, ineffective and without scientific basis may feel further vindicated by the latest study, reported in the Daily Telegraph. Scientists at Imperial College and the Zoological Society of London (ZSL) attached GPS collars to hundreds of badgers and cows and monitored how close they came to each other at 20 farms in Devon and Cornwall. Over a course of 18 months the badgers did not come within 16 feet (five metres) of each other. It is thought the animals would need to be within five feet for disease to be spread. The researchers concluded that TB was being passed between the two populations through pasture contamination, which also meant that infected cows could be passing it between themselves, and farms could remain disease hotspots even when animals have been culled. Scientists said it proved that cows were not the "innocent victims" of outbreaks, but probably equally culpable of spreading disease both to themselves and to badgers. Prof Rosie Woodroffe, Senior Research Fellow at (ZSL), said: “The badger TB issue is very sensitive. It does not mean that badgers don’t give TB to cattle. “We have very strong evidence to show badgers do give TB to cattle. What this suggests is more likely that this is happening through the environment rather than direct contact. “We’ve also got some pretty strong evidence that cattle give TB to badgers. This helps to explain why TB is so hard to control. It can survive a long time in the environment. “This study raises the possibility that some elements of cattle-to-cattle transmission might happen through the environment. TB isn’t managed in cattle that way. If a herd gets TB, they are kept in isolation but the pasture that they have grazed on, their dung is not treated as an infectious substance. “That would be a big change to TB management to cattle." The implications of these findings are that vaccination and disease management are better ways of controlling the spread of this disease than culling wildlife. If DEFRA and the Welsh Government are serious about tackling this disease then they need to protect animals from getting it in the first place and ensure that where farms have been infected then the environment the animals live in is treated as well to prevent further infection. You have to hand it t UKIP, no sooner have they dug themselves into a hole then there is a clamour amongst the membership to dig it deeper. The stand-off between UKIP's Welsh leader and the group on the Welsh Assembly really got interesting yesterday as Nathan Gill dug his heels in and refused to quit either of his two roles despite the Sunday deadline whilst 12 constituency chairs threw their weight behind him. Agreeing with Mr Gill's position, the letter sent to the NEC by the 12 apostles said: "It is clear that there is no viable candidate to assume his role in Brussels were he to step down and it is only right that he continues to serve the voters as an MEP as well as lead the party in Wales. "To call on him to resign his seat on the Welsh Assembly, as the man who spearheaded the campaign, beggars belief." Meanwhile, over at UKIP HQ, the seven dwarfs fighting over the leadership became just six as the favourite, Steven Woolfe was prevented from standing due to the fact that he failed to get his nomination form in on time. Presumably, he was rehearsing for the role of Dopey. It is not clear how anybody could hope to lead a party, which has aspirations to become a serious Parliamentary presence, when a basic error like this shows them up to have the organisational ability of a gnat. Nevertheless, the decision to exclude Mr. Woolfe from the process has left his putative deputy, Nathan Gill further out in the cold whilst also creating yet another schism in the party. Three NEC members have quit in protest at what they believe is a “coup” by senior figures who want to move on from the Farage era. Others might just call it incompetence. Perhaps they need to get a dictionary. Rumours are now rife that Nigel Farage may come out of retirement (again) and try to overturn the decision by halting the election and calling an emergency meeting of UKIP members with a request to abolish the NEC. The decision might also be challenged in the courts. There is also growing speculation that Mr Farage and Arron Banks, a millionaire businessman who was backing Mr Woolfe, might break away from Ukip to form a new, internet-based party modelled on Italy’s Five Star Movement launched by the comedian Beppe Grillo. It is thought that about 10,000 of Ukip’s 50,000 members might join them. Only the arch-nationalist and anti-European Farage could base a new party on one created in Europe by a clown. Meanwhile, those UKIP members who choose to stay with whatever remains of their party may be lost for choice as to who will lead it. According to the Guardian, the candidates include a golliwog fan, a Putin admirer and a semi-professional wrestler. And to think we complained because we had to put up with Lembit Opik. Amongst the candidate we have Lisa Duffy, a Cambridgeshire councillor, who hit the headlines on Wednesday, in calling for a “total ban on Muslim schools” as part of her “commonsense policy platform”. There is also Bill Etheridge, who is a West Midlands MEP. He joined UKIP in 2011 after being thrown out of the Tories for posing with golliwog dolls in a Facebook post that he said was trying to stimulate “healthy debate” about whether the dolls are racist. He hit back by writing a book celebrating golliwogs, titled Britain: A Post-Political Correctness Society. Shortly after Mr. Etheridge became an MEP in 2014, the party was forced to defend him after he described Adolf Hitler during a speech to youth activists as a “magnetic and forceful performer” who “achieved a great deal”. The Guardian says that Etheridge has outlined a succession of eye-catching policies since announcing his candidacy, including a referendum on bringing back the death penalty, slashing beer duties to save British pubs and charging prisoners £40,000 a year. He has also proposed banning burqas in public. Diane James is the deputy party chair and Ukip’s spokesperson on home affairs and justice. 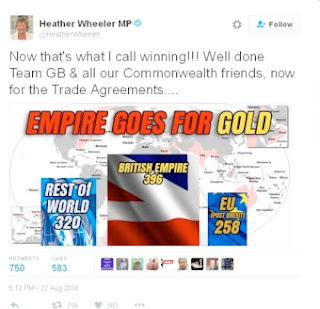 She is an MEP for south-east England. Last year she praised Vladimir Putin for his “nationalism”, saying: “I admire him from the point of view that he’s standing up for his country. He’s very nationalist. I do admire him. He is a very strong leader.” During the Eastleigh byelection, she was forced to apologise after commenting on “crime associated with Romanians”. Finally, there is Elizabeth Jones. She is deputy chair of the Lambeth Ukip branch, and one of the more colourful candidates in this year’s contest, telling a UKIP website her favourite newspaper is the Times of India, and citing Boudicca and Margaret Thatcher as reasons UKIP voters should back her campaign to be the party’s London mayoral candidate. This contest could prove very entertaining indeed. So how should we reform the honours system? The Independent and the BBC report what must surely be the final chapters on the Cameron 'chumocracy' honours awards. They run with the news that the ex-Prime Minister's attempt to award a peerage to former Tory treasurer, Michael Spencer, who has been involved in a major City scandal, has been "blocked" by the honours committee and that businessman Ian Taylor, who was reportedly in line for a knighthood, has said he does not want his name to go forward. From what we understand it is not unknown or even a recent phenomena for the honours committee to block appointments. Nor is it unknown for Prime Ministers to honour their pals. Those of us who are a certain age will remember Harold Wilson's 'lavender list' for example and let us not even start on David Lloyd George's fundraising efforts. The difference in the twenty first century appears to be a greater level of scrutiny and more leaks. That is not a bad thing. Many politicians of course have jumped on the media bandwagon by calling for the honours' list to be scrapped altogether or to be reformed so as to recognise the contributions of ordinary people. Those are valid points of view except that when those same politicians are in a position to do something about it they conveniently forget these high principles and fall into the same pattern of patronage and reward. Could that be because we cannot find a better system? There have been substantial changes to the honours system since the days of Harold Wilson. There is an open and fairly transparent process for non-politicians to nominate worthy individuals from their own community for example. That has led to many more lollipop men and women, school governors, play leaders, community workers and many others getting gongs. The vast majority of awards however, still go to the great and the good, to civil servants, members of the armed forces and of course political workers and donors. To an extent that is inevitable in a system that relies on patronage to operate effectively. Public servants are very rarely paid what they are worth, whilst in the absence of the state funding of political parties our democracy relies on a vast number of volunteers and individual donors to function. These people may well be propping up the great and the good in the citadels of power but without them we would not have a functioning democracy. Few of them do the work they do for personal reward but surely their contribution must be recognised by thanking them with more than a pat on the back. I know ordinary people who have been awarded honours for a lifetime of service to their community. I know politicians who have received gongs as a reward for their service to their country, to their party and to the people they represent. In all cases the pride of the recipient at being recognised for their work is matched only by the pride of their family and friends who have seen the personal sacrifices they have made for their community and are delighted that the system has seen fit to recognise that. There are changes that can be made to the honours system of course. We can better regulate the funding of political parties so that they no longer rely on donors who, in some instances are perceived to be buying influence. We can abolish the appointed House of Lords and replace it with an elected second chamber. We can improve the remuneration of civil servants and members of the armed forces and restrict further their access to cushy and often conflicted-interest jobs in the City once they leave their profession, and we can ensure that ordinary people who are often restricted to MBEs and OBEs are considered for higher awards. Fundamentally though, it is right that we recognise people's contribution to our society, to government and to politics in this way. The state as represented by the monarch, should continue to honour those who make this country and its democracy work, no matter at what level they operate. The astonishing internicine warfare within UKIP's Welsh branch took an astonishing turn yesterday with the party's National Executive Committee voting to expel its only MEP, Nathan Gill unless he resigns from one of his two elected positions. Gill is also a North Wales Assembly Member. "When he was seeking nomination for the assembly he said that if he was elected he would stand down as MEP and devote his time to furthering the interests of the people of Wales. He hasn't done so," he said. "I'm afraid we're only seven out of 60 members of the assembly. We can't afford part-time or half-time AMs. He has a choice. You can't do two jobs properly. He has to choose one or the other." On Friday, the chairman of UKIP Wales, Chris Smart, said Mr Gill should step down as an MEP as a successor was now available. Mr Smart said James Cole - who was number two on UKIP's Wales list at the 2014 European election and who has since rejoined the party - was ready to take over. However, Mr Gill previously said calls for him to quit the role had been made out of "malice". In an open letter, Nathan Gill said: "It is not for the NEC to inform me how to fulfil the mandate that I have been given by the electorate." He said he was "not going to be coerced by the NEC into resigning positions to which I have been either elected by the people of Wales or appointed by the party leader". Mr Gill added the decision may be "in clear breach of contract". A group meeting of UKIP's AMs is expected to discuss the issue today, however Nathan Gill will not be there. He told Radio Wales this morning that he is currently in Bangor and could not possibly get to the meeting on time. Whatever, Neil Hamilton wishes to call it, UKIP AMs have been fighting amongst themselves like ferrets in a sack ever since the Assembly elections. With the European referendum behind us there must be real questions now as to what UKIP are for and how they are relevant to Welsh politicsl, other than as a side show put there for our amusement? The end of the Thatcher social revolution? The 1980 Housing Act was arguably one of the most radical pieces of legislation in the second half of the twentieth century. Its objective was to transform the pattern of home ownership in the UK by giving millions of social housing tenants the right to buy their own home. By 2003-04 just over 69% of all homes in the UK were owner-occupied. In England that figure was 71%. Many tenants were able to live the dream of owning their own home thanks to generous discounts. There was though a downside to this picture with a substantial decline in the numbers of social housing and the growth in council waiting lists. The major flaw with the policy was affordability. The success of the UK economy has always been tied to house prices. The drive for home ownership saw a growth in demand from the 1980s onwards but relatively limited growth in supply as the house-building sector struggled to cope with rising costs, limited land supply and the fluctuating fortunes of the UK economy. As a result house prices have been increasing, and first time buyers have been finding it more difficult to get on the property ladder, whilst home ownership among younger age groups generally has declined. With the UK population continuing to grow, the demand for affordable housing has increased exponentially and the private rented market in particular has seen a proportionally greater growth. Now the Guardian reports that home ownership in England has fallen to its lowest level in 30 years as the increasing gap between earnings and property prices has created a housing crisis that extends beyond London to cities including Manchester. The paper says that home ownership has fallen to 64%, which is the lowest since 1986, when the number of people getting on the housing ladder was on the way up, due to a housing market boom fuelled by the deregulation of the mortgage industry and the introduction of the right-to-buy policy for council homes by Margaret Thatcher’s Conservative government. The problems faced by first time buyers in particular in getting mortgages, the continued sluggishness of the housing market following the 2008 credit crunch and the continuing rise in house prices have all combined to price many people out of the market. Advocates of Thatcher's home ownership revolution have discovered that you can only buck trends for a short time by selling off state owned homes cheaply, but that once the available stock is depleted market conditions will reassert themselves and levels of home ownership will level off to a more natural level, reflecting current economic conditions. The crisis in housing now is in supply and in particular the provision of affordable homes to rent. We need a state-sponsored house building programme to match that of the post-war years if we are to cope with demand and allow people to have a home of their own. That may mean suspending the right to buy on new build, effectively finishing off Thatcher's social revolution. Welsh Tory leader, Andrew R.T. Davies has a massive cheek in demanding in today's Western Mail that pro-European parties actively embrace the result of June's referendum. He complains that 'instead of accepting the result and seeking a positive outcome for a post-Brexit Wales, there is a sense of active hostility to it from the Welsh Labour Government and Plaid Cymru. A profoundly toxic political narrative is merging; a sense that they are privately willing it to fail.' Very much like the anti-European forces in the 1970s then, or the anti-devolutionists today. Mr. Davies should acknowledge that we live in a democracy which guarantees a hearing for minority opinions. But more importantly he also has to understand that those who are prepared to take responsiblity for governing Wales have to put the nation's best interests at heart, and that means ensuring that Brexit does not see reduced investment and a poorer economic climate for business. I happen to believe that Wales' best interests are best served within the European Union, that membership of the EU guarantees peace and prosperity for the forseeable future and that our diverse multi-ethnic society makes us stronger as a country. I am not going to abandon those views on Andrew R.T. Davies' say-so, nor will I abandon my opposition to those who have a different viewpoint. Everybody knows what Welsh voters narrowly voted against, but nobody can say what they voted for or what the consequences of that vote are. This problem is compounded by the lies and the undeliverable promises that won the referendum for the Brexiteers, a group which includes Andrew R.T. Davies. If we really could guarantee £350m a week extra for the NHS and that all the money coming to Wales from the UK Government and the European Union would continue to flow here after we leave then there would not be a problem. However, UK Government ministers are refusing to back up those guarantees and all those who fought for a leave vote on the basis of those promises have walked away and left it to others to take responsibility for their inconstancy. We have been put in the position of having to interpret the will of the people, many of whom voted to leave so as to give the establishment a bloody nose or because they believed the racist propaganda and lies being churned out by Farage and his ilk, that leaving the EU will curb immigration and save us from an influx of 70 odd million Turks. There is little wonder that remainers are hostile to the outcome of this vote. We are still waiting to see the opportunities that Andrew R.T. Davies talks about. We have yet to see how our relationship with the EU and the rest of the World will develop in the light of the leave vote. These are matters for UK politicians but Welsh ministers will be actively working to protect Welsh interests in that process. Yes, we must embrace whatever emerges from this mess so as to get the maximum benefit for Wales, but even then a healthy scepticism and a resolve to fight for better outcomes will be the order of the day. And in the circumstances who can blame Ministers and pro-EU parties for keeping their powder dry whilst actively scrutinising every promise, every set of talks and every utterance by the UK Government? Predicting the outcome of negotiations is beyond even the prescient crystal ball-gazer. It is certainly beyond Andrew R.T. Davies. The final terms of our exit from the EU may well be very different from that imagined today by leave voters and the absent leaders of the leave campaign. In my view that uncertainty makes the case for a second referendum on the final deal. Parliament must debate and endorse the Brexit terms, but voters also have to have the chance to endorse or reject the final deal. This is not a black and white issue. It is time the Welsh Tory leader understood and acknowledged that fact.